“Love Duets” is a selection of the most beautiful love songs in the operatic repertoire, performed by renowned vocalists and instrumentalists. 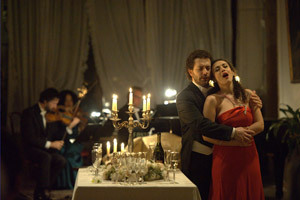 The duets reflect the various aspects of love: The unbridled passion of Floria Tosca, the fatherly affection of Georgio Germont from La Traviata, the jealousy of the characters in La Boheme, the narcissism of Don Giovanni and the sacrificial love shown by Violetta Valery in La Traviata. The programme alternates between chamber music and the opera duets, with the first part of the evening taking place in the Sala Tiepolo and the second in the room with the magnificent alcove. The performance "Love Duets" is a part of the cycle "Musica a Palazzo"